Dry pinto beans are cooked with spicy smoked sausage and a ham bone or ham hock, along with garlic, tomatoes, and seasonings. Serve these savory pinto beans with hot boiled rice or savory grits for a simple and satisfying meal. The pinto beans are soaked overnight, so plan to start the recipe the night before. Or follow the package directions for a quick soak. The night before put the pinto beans in a large bowl or pot and cover with water to a depth of about 3 inches above the beans. Let them stand for 8 hours or overnight. Drain well. Add the salt, sliced sausage, tomatoes, mild chile peppers, and crushed red pepper flakes, if desired. Cover, reduce heat to low, and simmer 1 hour, stirring occasionally. Remove ham hock and remove the meat from the bone. Shred the ham with a fork or chop. Return the ham to bean mixture. Serve the pinto beans over hot cooked rice. Some believe acidic ingredients like tomatoes, ketchup, molasses, wine, lemon juice, or vinegar can prevent dry beans from becoming tender. And some say hardness of the water can have a negative impact. 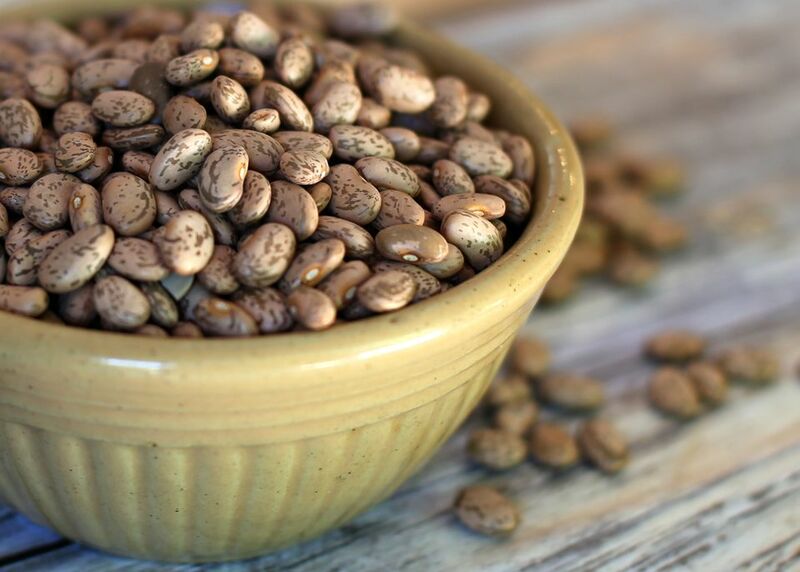 If you regularly have trouble with beans becoming tender, add acidic ingredients after the beans are tender. If the weather is very hot, soak the beans in the refrigerator. Use a spicy chorizo sausage instead of andouille sausage, or add extra diced ham. For Tex-Mex flavor, add 2 teaspoons of chili powder, about 1/2 teaspoon of ground cumin, and 1/2 teaspoon of dried leaf oregano. To cook the beans in the slow cooker, simmer them first with the ham hock, water, onion, and garlic until tender. Transfer them to the slow cooker with the remaining ingredients and cook on low for about 6 hours or on high for about 2 to 3 hours.